Why is Transit VPC performance capped at 1.25Gbsp? What are the use cases for Insane Mode? How can I deploy Aviatrix Insane Mode? What is the Aviatrix hardware appliance? How to deploy Aviatrix hardware appliance? 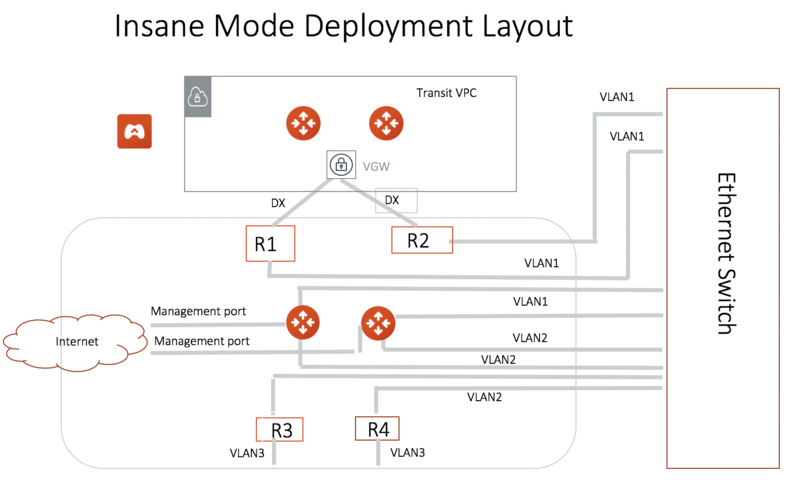 How to configure Insane Mode for Transit VPC? This document discusses Aviatrix High Performance Transit Network and answers related questions. In the current Transit VPC solution, the throughput is capped at 1.25Gbps regardless if you have a 10Gbps Direct Connect (DX) link. 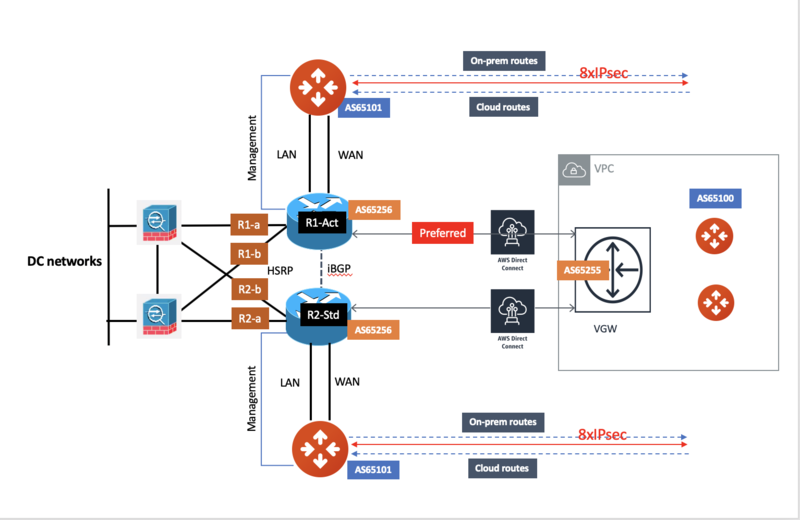 The reason is that in the Transit VPC deployment there is an IPSEC session between VGW and Transit gateway and VGW has a performance limitation. AWS VGW IPSEC has a published performance of 1.25Gbps. The truth is AWS is not alone, all cloud providers have that performance cap, in fact, all software based IPSEC VPN solutions have that performance cap. Most virtual routers or software based routers are built with general purpose CPUs. Despite the vast CPU technology advancement, why does not IPSEC performance scale further? 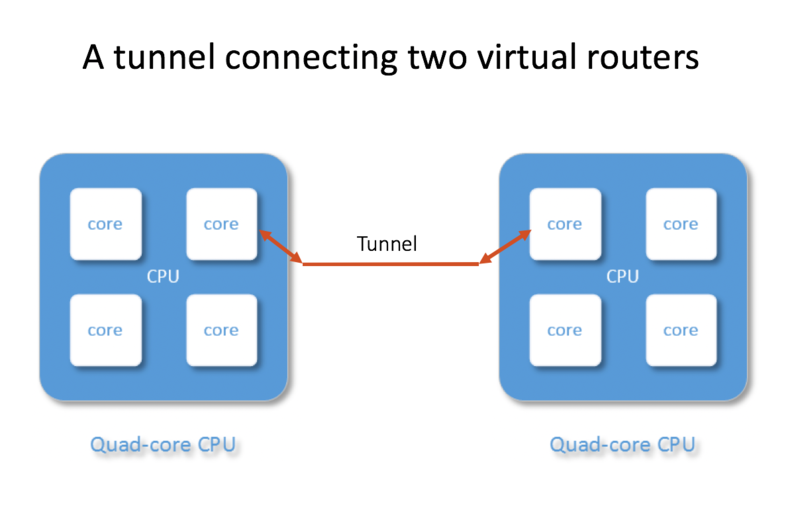 It turns out the problem lies in the nature of tunneling, a common technique in networking to connect two end points. When two general purpose server or virtual machine based routes are connected by an IPSEC tunnel, there is one UDP or ESP session going between the two machines, as shown below. In the above diagram, the virtual router has multiple CPU cores, but since there is only one tunnel established, the Ethernet Interface can only direct incoming packets to a single core, thus the performance is limited to one CPU core, regardless how many CPU cores and memory you provide. This is true not only for IPSEC, but also for all tunneling protocols, such as GRE and IPIP. Aviatrix Insane Mode tunneling techniques establishes multiple tunnels between the two virtual routers, thus allowing all CPU cores to be used for performance scaling with the CPU resources, as shown below. 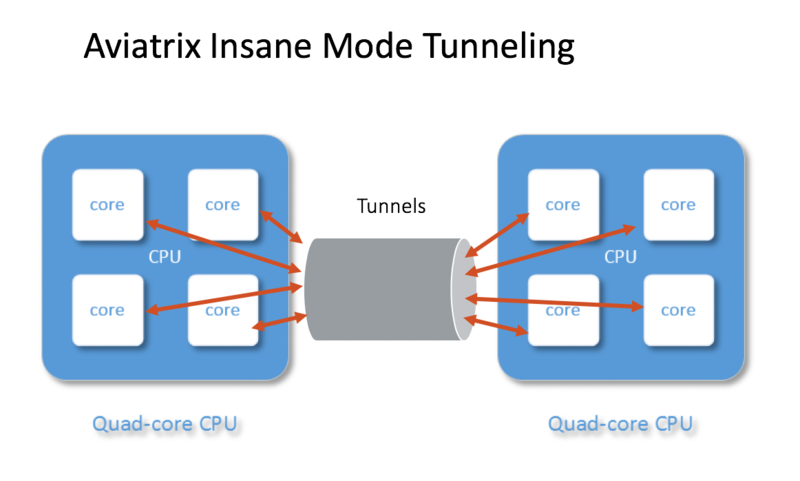 With Aviatrix Insane Mode tunneling, IPSEC encryption can achieve 10Gbps, 25Gbps and beyond, leveraging the multiple CPU cores in a single instance, VM or host. 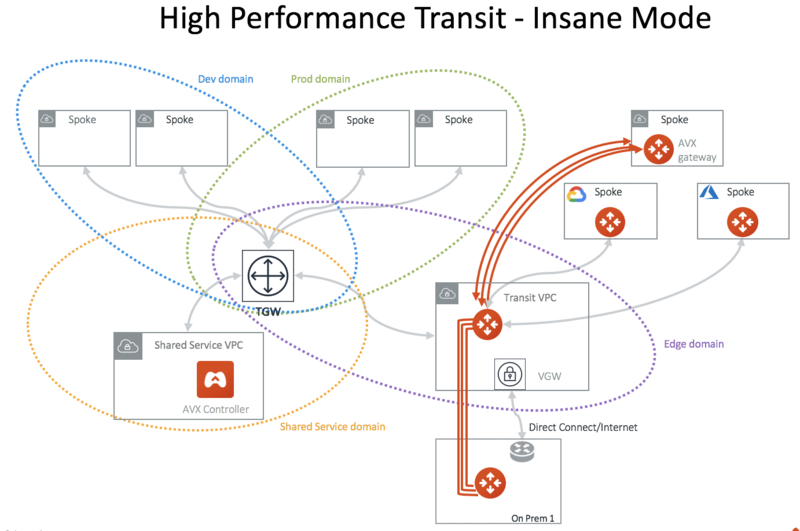 Aviatrix Insane mode is integrated into the Transit Network solution to provide 10Gbps performance between on-prem and Transit VPC with encryption. For VPC to VPC, Insane mode can achieve 20Gbps. Insane mode can also be deployed in a flat (as opposed to Transit VPC) architecture for 10Gbps encryption. 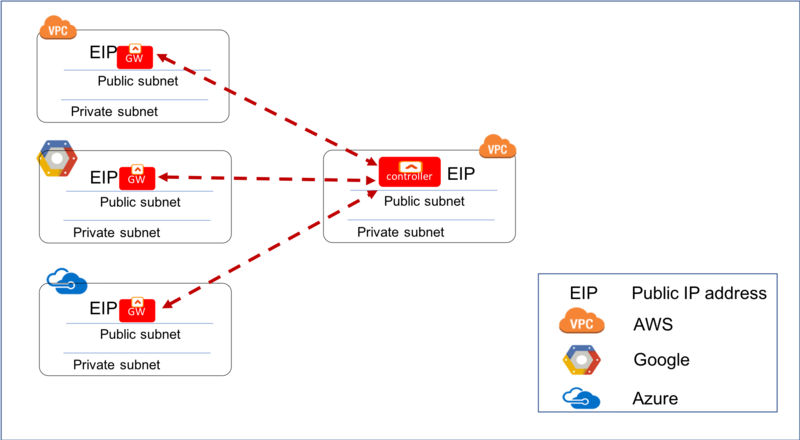 The diagram below illustrates the high performance encryption between Transit VPC and on-prem, between Transit VPC and Spoke VPC. 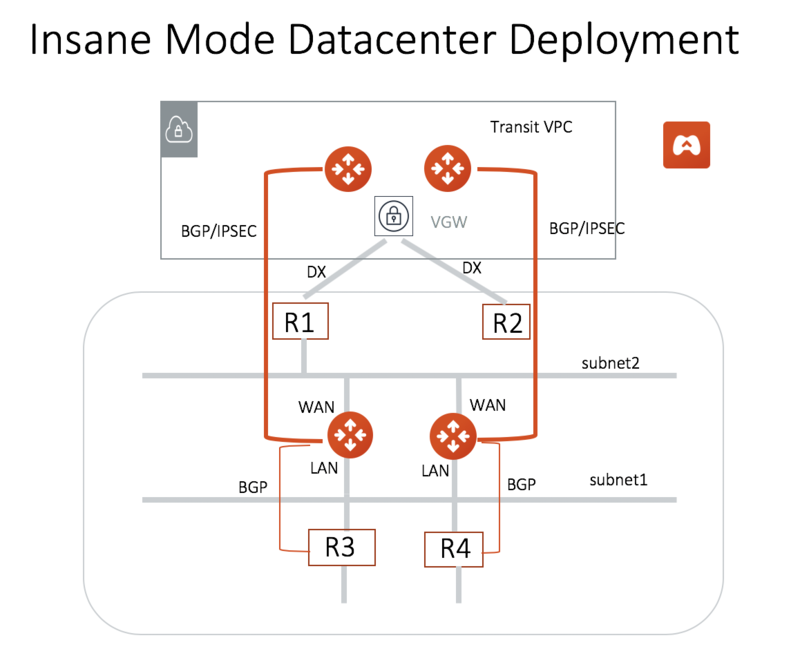 Insane mode is available on AWS for C5 series. For more performance test results and how to tune your environment to get the best performance, check out this document. Aviatrix offers a 1U rack mountable hardware appliance deployed in the datacenter. It works with the Aviatrix gateway. More information on HPE ProLiant DL360 Gen10 Server can be found here. 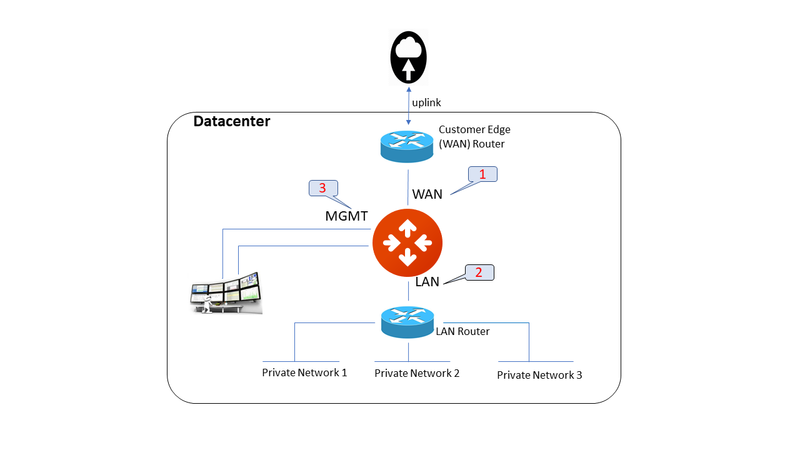 Datacenter deployment is shown in the diagram below with redundancy, where R1 and R2 are two edge routers that connect to VGW over DX. R3 and R4 are two routers connect to inside the datacenter. 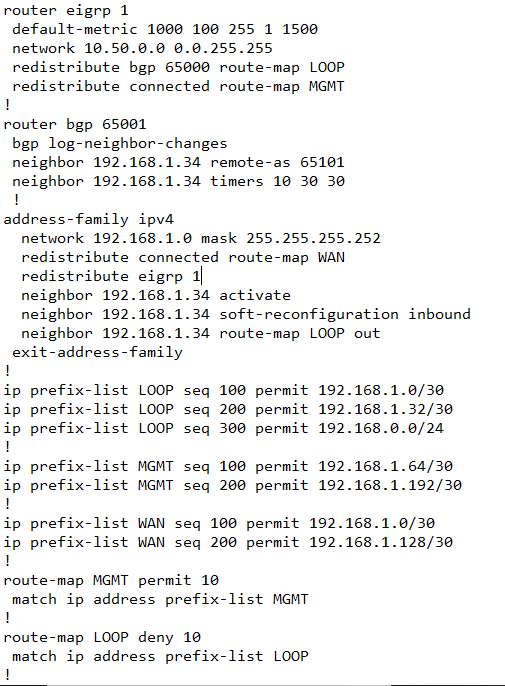 Aviatrix CloudN also runs a BGP session with R3 and R4 to collect datacenter routes. VGW is only used to terminate DX. 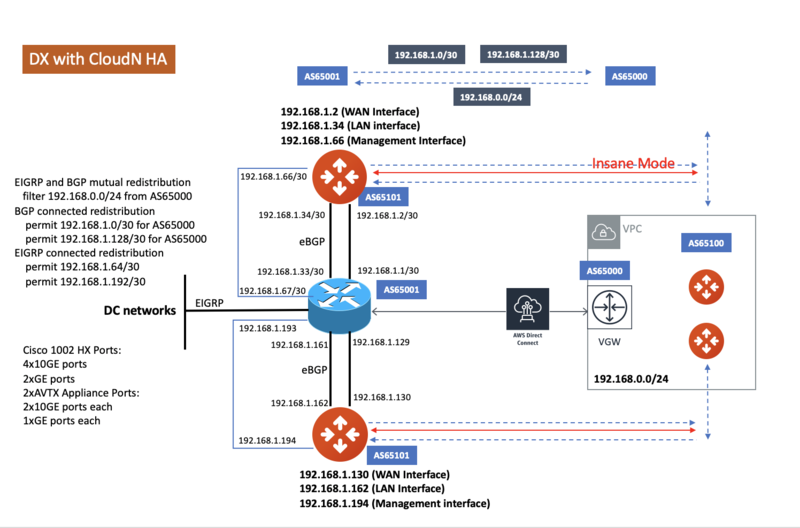 Aviatrix gateway and on-prem appliance CloudN run a BGP session to propagate on-prem routes to the Transit VPC. IPSEC tunnels are also built between the two. A logical deployment layout is described as below. And the sample configuration on an ISR is as follows. At Step 1 Transit Network workflow select “Insane Mode Encryption”. Please collect information requested below and provide to Aviatrix. Click the link here to download the application form. Aviatrix will pre-configure the IP addresses, subnet masks, default gateway and DNS servers on CloudN before shipping the unit. CloudN appliance does not require public IP address, but the management port requires outbound internet access on the management port for software upgrade. BGP is required between LAN port of the appliance and the on-prem router for route propagation.